Madurai KSHETHRA Madurai KSHETHRA, madurai meenakshi temple, madurai meenakshi temple history - Shiva Maha Purana, Vishnu Purana, garuda purana, bhavishya purana, skanda purana. Madurai is well know all over the world because of the magnificent temple of Goddess Devi Menakshi. Madurai also which is stepped in cultural and literature. It is the second largest city in Tamilnadu and one of the most ancient pilgrim center in India. Reference to this city is made in the Indian epic Ramayana and Kautilyas Arthasasthra and also we know the foreign travellers Magastheness 302B.C., and Ptolemy 140 A.D during the reign of Pandion Kingdom. Madurai is situated on the banks of River Vaigai. 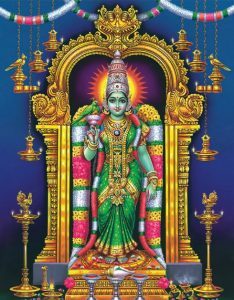 Legend has it that Godess Meenakshi was born to King Malayathuvasn Pandion and Queen Kanchanamala.She was married Lord Shiva, who came Sundareswarar. Madurai has a rich cultural heritage passed on from the great Tamil era more than 2500 years old. Madurai was an important cultural and commercial centre even as early as 540 A.D., Madurai was the capital city for the great Pandya kings. The other places of interest are the Koodalalagar Perumal temple, Thiruparankundrum, Thirumalai Naick Palace,Mariamman Teppakulam, Alagarkovil and Pazhamudircholai.